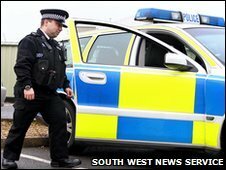 A Devon policeman is thought to be Britain's smallest officer, at just 5ft (1.5m) tall. Pc Robin Port, 29, has joined the Devon and Cornwall force in Tiverton after completing his training. Height restrictions in the past meant that the force's policemen had to be 5ft 8in, but discrimination laws have changed that. Pc Port who has martial arts training, is confident he can hold his own and has made 17 arrests in his first month. The former army lance corporal who served in Oman, Kuwait, Iraq and Northern Ireland also enjoys weight training, running, cycling and hill walking. He worked for nearly three years behind a desk at the force's Crime Data Input Bureau as a civilian member of staff before becoming an officer. Forces around the country have relaxed their own minimum height rules since the 1990s. A spokesman for Devon and Cornwall Police said: "Over the years there have been many changes to the selection criteria used for police officers. "There was once a minimum height requirement for male police officers of 5ft 8in tall, however it has been made illegal to discriminate against or reject applicants on the basis of their height. "The stringent assessment procedures used during recruitment of police officers tests many skills, including a physical ability to do the job."